Taalman’s Calculus I with Integrated Precalculus helps students with weak mathematical backgrounds be successful in the calculus sequence, without retaking a precalculus course. Taalman’s innovative text is the only book to interweave calculus with precalculus and algebra in a manner suitable for math and science majors— not a rehashing or just-in-time review of precalculus and algebra, but rather a new approach that uses a calculus-level toolbox to examine the structure and behavior of algebraic and transcendental functions. This book was written specifically to tie in with the material covered in Taalman/Kohn Calculus. 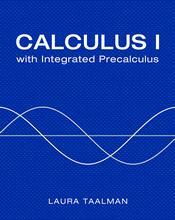 Students who begin their calculus sequence with Calculus I with Integrated Precalculus can easily continue on to Calculus II using the Taalman/Kohn text.